In 1972 and 1973, NASA launched two simple spacecraft, Pioneer 10 and 11, to Jupiter. They were charged with scouting the way for the more sophisticated spacecraft that would follow. Since then, the outer solar system has been the realm of large, expensive missions: the Voyagers, Galileo, and Cassini. Large missions costing well over $1B have proven very successful, but they are launched at the rate of approximately one per decade and outer solar system destinations have had to vie with Mars for these rare slots. At last month’s Outer Planet Analysis Group, scientists and engineers presented three proposals in competition for selection in NASA’s cheapest category of planetary missions, the Discovery program. One other proposal may eventually vie for a slot in NASA’s mid-range New Frontiers program. The road to lower costs outer planet missions has been paved by NASA’s first two New Frontiers missions, the $700M New Horizons mission en route to Pluto and the $1.1B Juno mission en route to Jupiter. But can the cost of a mission to the outer solar system be cut to $450M, the limit for a Discovery mission? The three Discovery proposals take very different approaches. 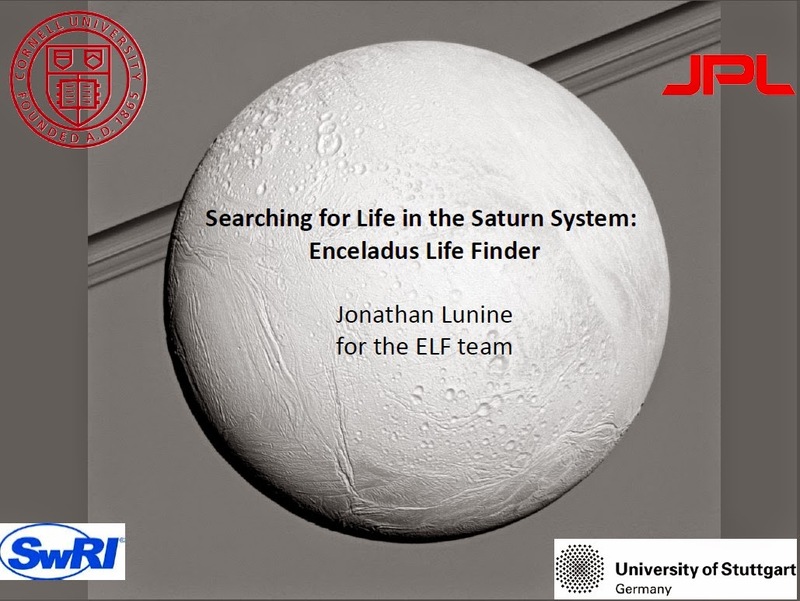 The Enceladus Life Finder (ELF) team proposes to take the tightly focused, minimalistic path. We now suspect that many of the icy worlds in the outer solar system harbor oceans beneath their icy crusts. Among those bodies, Europa and Enceladus are special because their oceans appear to rest atop their rocky cores, providing access to elements and minerals believed essential to life. These rocky surfaces are also are believed to have hot hydrothermal springs that could provide the energy needed for the complex chemistry needed to support life. For other icy worlds, the oceans are sandwiched between layers of ice and not in contact with their rocky cores, making Europa and Enceladus priorities for exploring potentially habitable worlds. The Cassini spacecraft currently at Saturn has already sampled the plumes, but its instruments were designed in the 1990s, and weren't designed to study the highly complex molecules that could indicate life. The ELF spacecraft would narrowly focus on sampling these plumes with modern, highly sensitive instruments. The mission would enter orbit around Saturn and then make ten flights through Enceladus’ plumes. ELF’s instrument payload would consist of two mass spectrometers that “weigh” atoms and molecules to measure composition. The spectrometers would analyze particles in the plume that are a mixture of frozen ocean water and particles from the seafloor. One of the mass spectrometers would be optimized to study the liquids that originate from the ocean and the other the solid particles that likely originate from the rocky core. A third instrument might be included that would test whether any amino acids found have predominately left- or right-handed structures. (Life on Earth predominately creates left-handed forms, and it’s suspected that life that originates elsewhere will similarly favor one form over the other instead of a random mixture likely from abiotic chemistry.) The spacecraft’s navigation camera also would image the plumes to judge their activity at the time of each flyby. To appreciate the simplicity of the ELF proposal, you need to consider previous concepts for exploring Enceladus following Cassini’s last flyby late this year. When Decadal Survey considered this decade’s priorities for exploring the solar system, several Enceladus options were considered. The simplest would have been a multi-flyby spacecraft like ELF, but that would also have included two cameras and an ice penetrating radar in addition to the mass spectrometers. The preferred mission would have studied Enceladus both during flybys and from orbit about the moon with a somewhat different, but equally rich instrument compliment. These concepts would have generated volumes of data that would have investigated the structure of Enceladus, its ocean, and ice shell along with the chemistry of its internal ocean. Unfortunately, the estimated costs of these missions were over $1.5B. 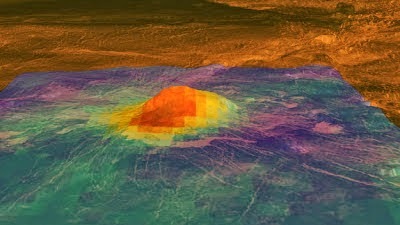 The Io Volcano Observer would take a different tact than the ELF mission. Like the proposed Enceladus mission, the IVO spacecraft would observe Jupiter’s volcano-rich moon during several flybys. 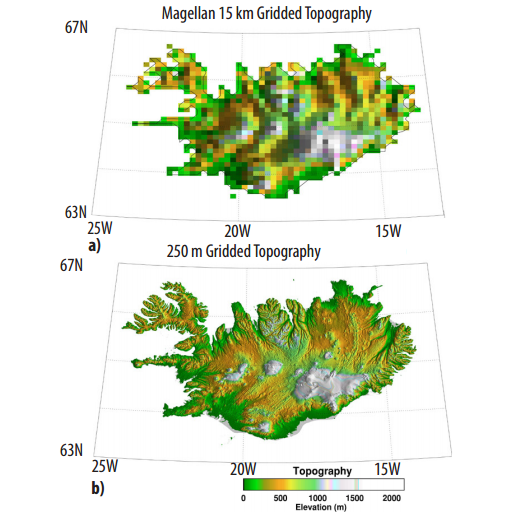 Unlike the Enceladus mission, the Io mission would carry four instruments – a two camera suite, a thermal imager, a magnetometer, a mass spectrometer – along with a student-built instrument to map volcanic hot spots. The spacecraft’s radio system would do double duty by also allow precise tracking of the spacecraft’s speed during flybys to study the distribution of matter within this moon. This would be a data rich mission, and the spacecraft would carry an experimental high data rate optical communications system in addition to the traditional radio system. 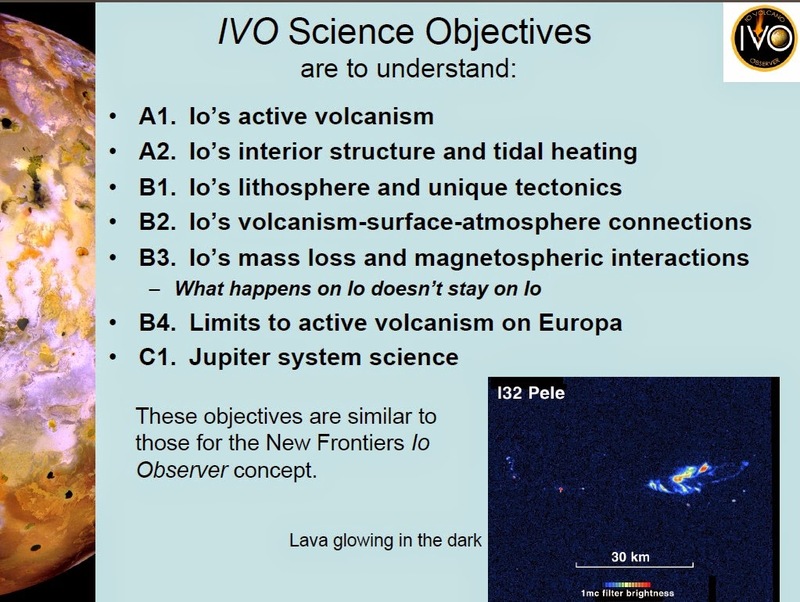 While ELF would focus on one investigation – the chemistry of the ocean – IVO would perform an integrated series of studies to understand Io as a world and a member of the Jovian system. The mission’s goals are divided between understanding the sources and extent of its intense volcanic activity, the effects of the injection of its volcanic plume material into the wider Jovian system, and long term monitoring of Europa for plumes and Jupiter’s atmosphere. The nominal mission would last 22 months, but an extended mission might carry on for an additional 6 years to monitor Io through time. 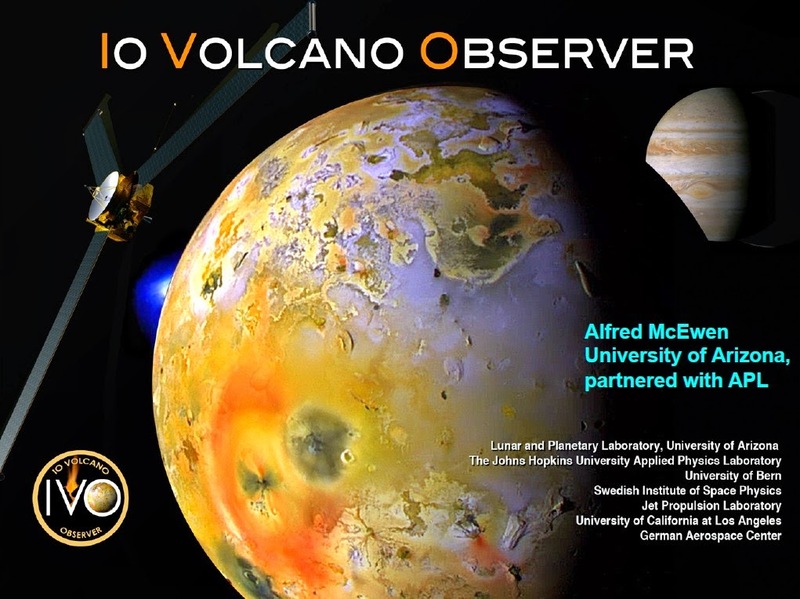 If the extended mission occurred, then we might have three spacecraft simultaneously studying the Jovian system in the early 2030’s: IVO in a polar Jovian orbit with periodic flybys of Io, Europe’s JUICE mission with broad studies of the Jovian system and a focus on the icy moon Ganymede, and NASA’s Europa mission. The third Discovery proposal takes an entirely different approach to exploring the outer solar system on a budget. 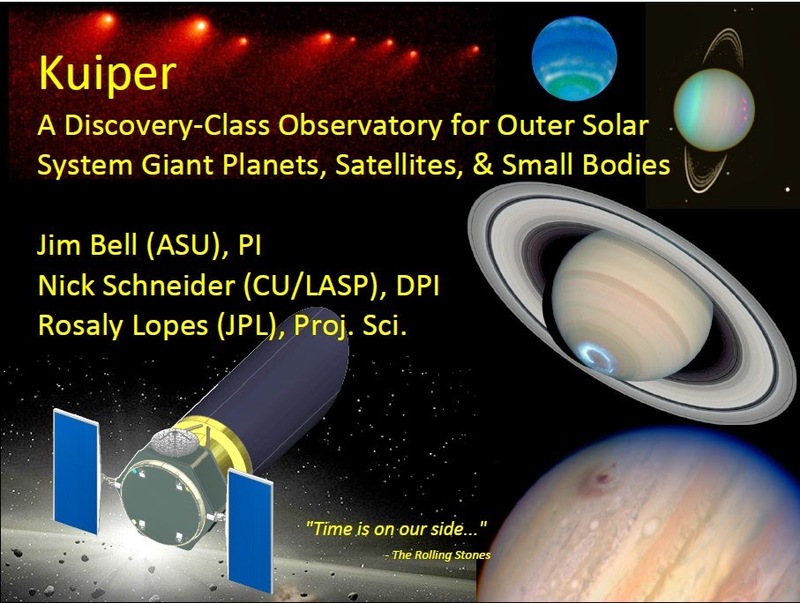 The Kuiper mission would launch a space telescope dedicated to studying the outer solar system. The Kuiper proposal addresses two problems. First, we cannot afford to have spacecraft at each of the major outer planets to observe their weather, their magnetospheres, and their moons. This dedicated outer solar telescope would be able to examine each of these worlds multiple times each day to study these worlds as dynamic systems. Scientists will be able to observe how storm systems in their atmospheres exchange energy, how variations in auroral activity provides clues to the state of their magnetospheres, and how volcanic and plume activities on the moons Io, Europa, and Enceladus vary over time. The second problem is that we don’t understand key questions about the formation of the outer solar system. We suspect that the outer planets migrated during the early ages of the solar system, but there are competing theories as to whether that migration was smooth or more chaotic. As the planets’ orbits shifted, they would have flung smaller bodies about. The Kuiper telescope would analyze the spectra of thousands of small bodies ranging from Jupiter’s orbit to the distant Kuiper belt to analyze their compositions. The mixture of compositions at different distances from the sun would allow astronomers to distinguish between the competing theories. Telescopic observations have always played a crucial role in studying the outer solar system. Earth-based telescopes, however, have key limitations – any solar system target is visible for only a few hours each day and our atmosphere blurs vision and blocks key wavelengths of light. 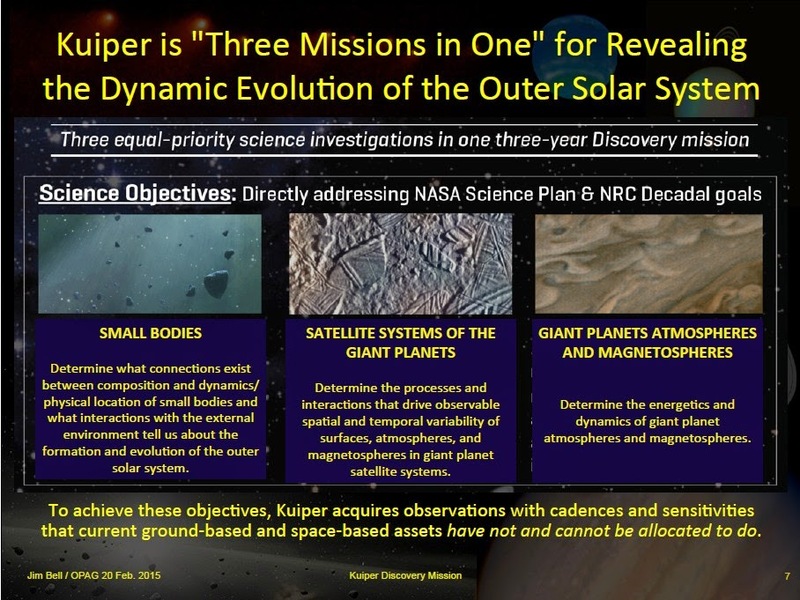 The science proposed for the Kuiper mission could be done by the Hubble Space Telescope, but its observing time is precious and little is allocated to solar system studies. The Kuiper mission would be smaller than Hubble (a 1.2 meter primary mirror versus the Hubble’s 2.4 meter mirror) but would be dedicated to observing the outer solar system. The spacecraft would be parked in an orbit around the L2 Lagrange point beyond the moon where it could observe the sky without Earth occultations and would be beyond stray Earth light. In addition to the three Discovery mission proposals, a fourth mission concept was proposed, the LIFE Enceladus Sample Return. A previous incarnation of this mission was proposed for the last Discovery competition but wasn't selected. 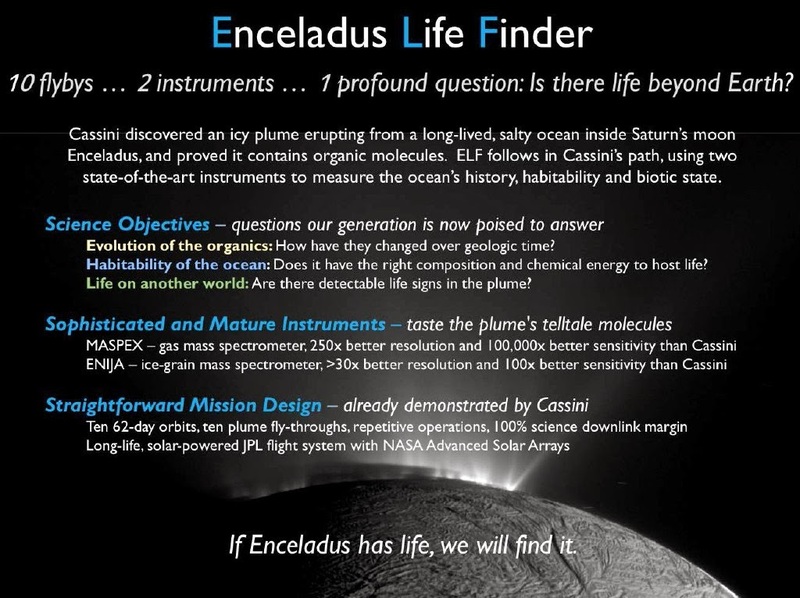 Like the ELF mission, the LIFE mission would make multiple flybys through Enceladus’ plumes and would use a mass spectrometer to study their chemistry. Unlike ELF, the LIFE spacecraft would collect dust plumes in a fashion similar to that done by the Stardust spacecraft that collected comet dust samples in the mid-2000s. The samples would later be returned to Earth where far more sensitive measurements would be made than could ever be done by instruments on a spacecraft. The cost estimates presented by the LIFE team puts the mission outside the current scope of the Discovery program, and the team is building support to add an Enceladus sample return mission to the New Frontiers candidate mission list for the 2020s. After 2017, there are no plans to have a spacecraft operating in the outer solar system until the late 2020s at the earliest. That decade gap will exist because outer planet missions in the past have had to be infrequent because of their costs. The four proposals presented at last month’s meeting represent the planetary community’s attempt to find a new class of much lower cost missions that could fly more frequently. The Kuiper telescope would be an entirely new approach to the problem that could begin providing data in the early 2020s. The missions to Io and Enceladus face a tougher challenge because they propose to do missions for half the cost of any previous outer planet mission orbiter. 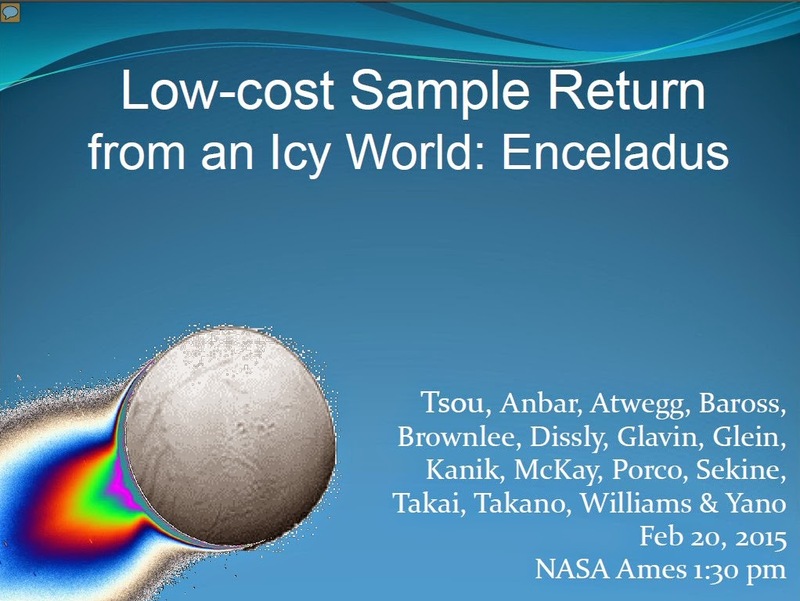 Missions to both Enceladus and Io have been studied before, and the costs were two to four times that of the cost cap for Discovery missions ($450M). Teams that propose missions are generally fairly open about the great science their missions would do if they are selected to fly. These teams tend to be much more reluctant, however, to discuss the specifics of how they would accomplish their goals within the tight cost caps of a Discovery competition – that is their secret sauce. The teams proposing ELF and IVO are seasoned veterans and their credibility gives me hope that the outer solar system may open to low cost missions. We can assume that they have had a laser focus on finding ways to reduce costs to a fraction of what previous studies have assumed. Estimating development cost, however, is always part art. NASA will perform its own assessment of mission risks and costs, and its reviewers may be more risk adverse and conservative than the mission proposers in assessing likely costs and risks. For this Discovery competition, NASA’s managers have changed the rules in a key way that will help outer planet proposals. In previous competitions, the costs of mission operations had to be included in the mission cap. A mission to Mars with an operations lifetime of two to three years had an inherent advantage over an outer planets mission that might take five to seven years to reach its target and then require another year or two of operations. Now NASA has excluded “reasonable” mission operations costs from the cost cap (which means it picks up those costs separately). This goes a long way to leveling the playing field between inner and outer solar system Discovery proposals. In the last Discovery competition, a mission to land on a lake in the north polar region of Saturn’s moon Titan made it to the list of finalists. (The Mars InSight geophysical lander was the winner.) If either ELF or IVO is selected this time, then outer solar system will have been opened to exploration by a new, low cost class of missions. If neither mission is selected, then the experience learned from these proposals will become part of the community experience that is likely to sharpen future Discovery proposals for the outer solar system. I believe that eventually an outer planets Discovery proposal will find the right formula for selection; I hope that this happens sooner rather than later. You can read the original presentations for these proposals as well as the other presentations from the OPAG meeting here. Cover page for the EnVision proposal. The European selection process tends to be more open than the U.S. process, and the EnVision team led by Dr. Richard Ghail at Imperial College London shared a copy of their proposal to ESA with me. While EnVision is out for this current M4 contest, reviewing its proposal can still let us see what type of Venus mapping missions are being proposed. The proposals to NASA’s current Discovery program will have differences from EnVision and the cost assumptions are different. Also, ESA is expected to begin the competition for its 5th Medium Class mission later this year and there may be a larger mission budget. The EnVision team hopes to propose this mission, perhaps with modifications, in the next competition. To get a mission selected for Venus requires playing the long game. Each competition that a team doesn’t win gives them feedback on how to improve their proposal. 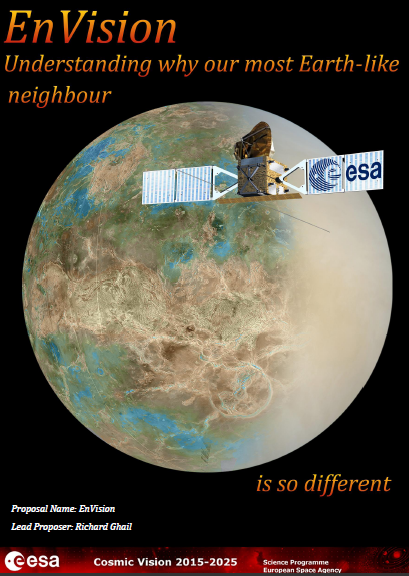 So let’s look at what a Venus mapping mission might look like using the EnVision proposal as are guide. 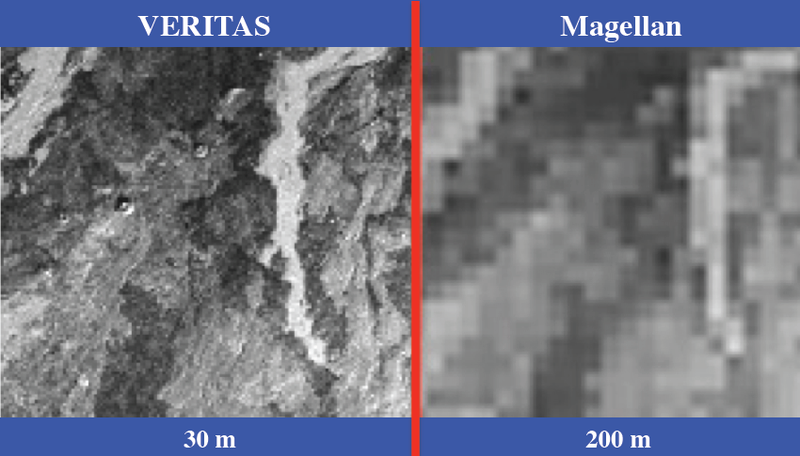 Example of the ability to detect geologic changes in vertical heights as small as a few centimeters. 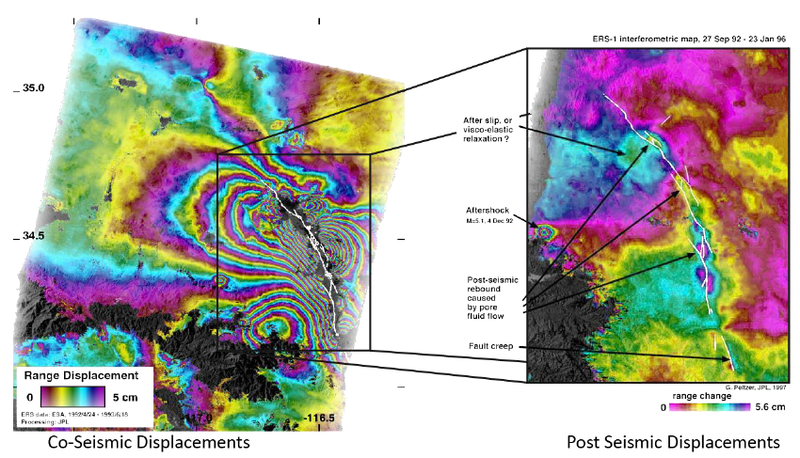 This example is from an Earth-orbiting radar mission for changes following a terrestrial earthquake in 1992. Credit: EnVision proposal, Fialko 2004; Peltzer et al. 1998.